Discussion in 'Washington D.C.' started by LewSir, Apr 16, 2019 at 8:15 PM. Cher should never use the word lizard with her stretch face, Pelosi either. Big Dave, Northern Flash, Ted Decker trk and 2 others like this. Ted Decker trk and Rastus like this. Keepingon, Northern Flash, buffalobill and 2 others like this. buffalobill and Ted Decker trk like this. 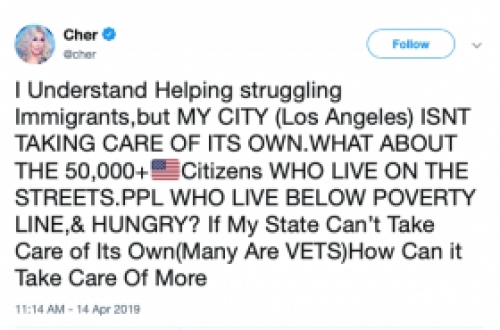 Cher caught hell for agreeing with Trump on immigration. The Dems won't allow anyone to leave their plantation. They attacked her, so she has ran back to the Democrat plantation and slipped the shackles back on. Big Dave, Rastus, buffalobill and 1 other person like this. i thought they were going to live with magoo? That pipeline same thing ya ya we want it hey were running it under your towns main street no no get it out of here we dont want it ! I guess that Cher is concerned about having to walk on human excrement when she goes shopping. But I guess that it's okay for everyone else to have to walk in it.